Image caption Graham's doctor suggested he join a local walking group in Stockport two years ago. Graham Ward was 60 when he was diagnosed with type-2 diabetes. It came after decades of eating and drinking too much in a high-stress, sedentary job: "It was an explosion waiting to happen," he said. For Graham, whose wife had become increasingly disabled through multiple sclerosis, the diagnosis was a wake-up call. "I need to be able to help her - and I need to be around for longer," he said. Graham is not alone in his diagnosis. Public Health England estimates that 42% of 45- to 64-year-olds have a long-term health condition such as diabetes or heart disease. This week, it urged middle-aged people to walk more often and more briskly. It is encouraging those between the ages of 40 and 60 to start doing regular brisk walks of just 10 minutes a day. One in five middle-aged people is physically inactive, engaging in less than 30 minutes of exercise a week, it says. To help, the government agency is promoting a free app - Active 10 - which can monitor the amount of brisk walking an individual does and provide tips on how to incorporate more of it into the daily routine. 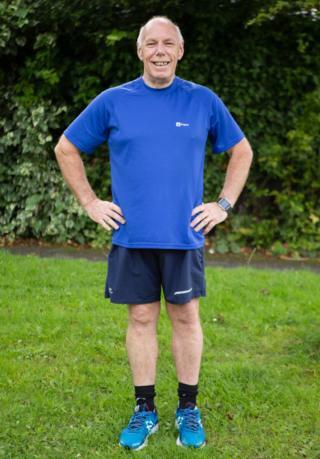 When Graham was diagnosed as a diabetic, he realised he needed to make changes: "My clothes were getting tighter, and I was hearing how being overweight could affect my life and health in other ways," he said. Diabetes has been linked to other issues such as heart disease, stroke and kidney disease, causing a reduction in one's life expectancy. He said beforehand he had managed to turn a blind eye to this. "When someone is in front of you telling you it's you, there's nowhere to hide," he said. "They're not talking about the other millions of people out there." Graham's doctor suggested he should join a local walking group in Stockport. "I started and I was a bit nervous. With a couple of hills, it was more walking than I'd been doing," he said. He was talked into the 1.9 mile walk by the group leader. "After the first time, I overcame all those fears." He invested in a pair of new shoes and gradually increased his walks to reach five miles. "It was a very quick improvement, once you realise after the first one or two that you don't become immediately breathless and that you can walk further from home than you thought," said Graham. "I moved on from walking with that group, to walking by myself, walking further distances and the pounds started falling off me." He used a pedometer to make sure he was reaching the recommended 10,000 steps a day. Now he does about 15,000 steps and has lost 50lb. "My trousers were falling off me. I had to throw away all the clothes I owned," he said. Graham said the benefits were not only physical. "I'm fitter, healthier, more confident. When you start walking you see things in your area that you haven't seen before, such as discovering canal towpaths." His advice to others is not to be "disappointed if it doesn't happen in the first few weeks". Now, he and his wife diet and swim together. "When I'm playing with my grandchildren now, it's them that get tired before me," Graham said.